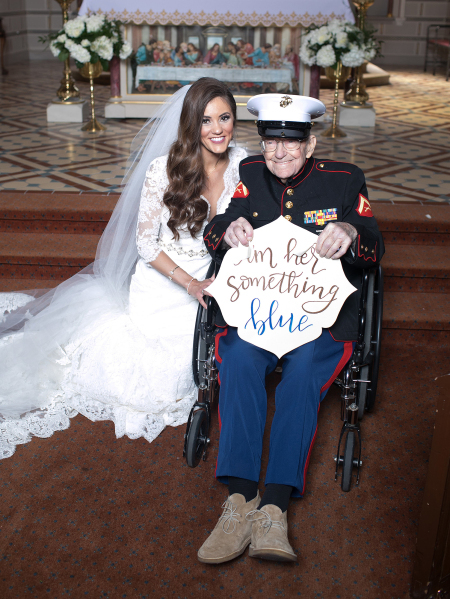 Bride Alison Ferrell had a very special "something blue" at her wedding — her 92-year-old uncle! 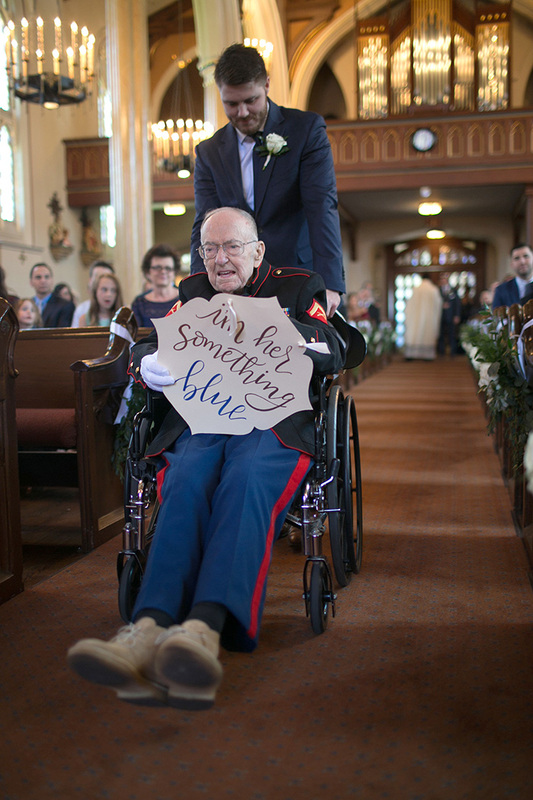 Bill Lee Eblen, a WWII and Korean War veteran, came down the aisle carrying a sign that read, "I'm her something blue." "It meant everything to me that he was there as my something blue," Ferrell told PEOPLE. 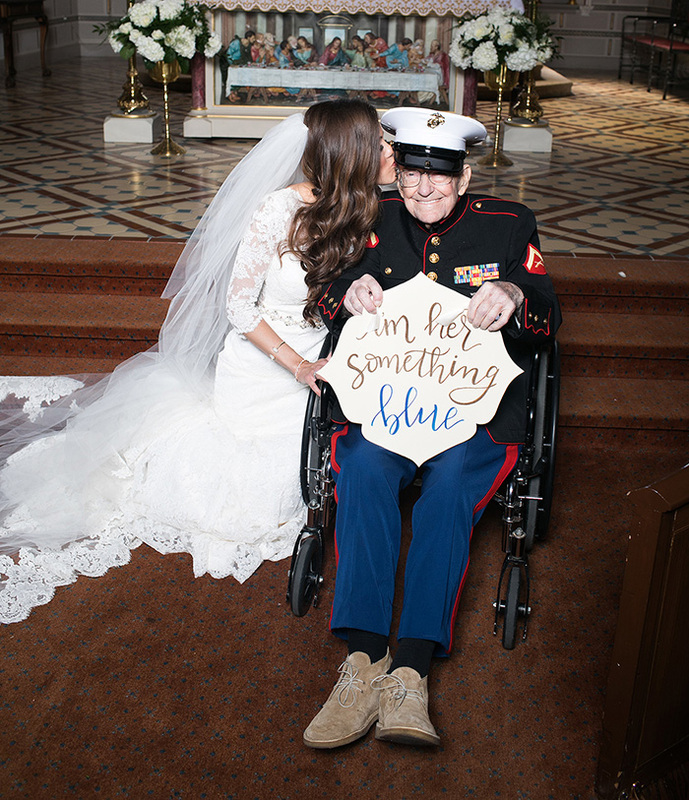 "I come from a family where we have great respect and admiration for those in the armed services, so having him there in his blues was perfect." "It was so special to me!" said Eblen. "I knew I wanted to honor him in a special way," Ferrell explained. "We are a large, close-knit family and he has always been at every special moment in my life. So of course my wedding was no different." "It made me happy to see him happy." Ah what a lovely honour for both him and the bride. Bet he was really chuffed. Look at his lovely smile! Very pretty bride...and she looks like her handsome uncle, no? Same symmetrical face, strong jaw line and pleasing smile. Also, desert boots were always a favorite of mine. When my son returned from AFGHAN, he brought home 3 pairs of Desert Boots, [American ones} the British ones were crap. He burnt them in our garden with due ceremony. Don't think he killed any Babies, but he did take a Bullet in his leg and lost 1 mate dead ! nicko wrote: When my son returned from AFGHAN, he brought home 3 pairs of Desert Boots, [American ones} the British ones were crap. He burnt them in our garden with due ceremony. Don't think he killed any Babies, but he did take a Bullet in his leg and lost 1 mate dead ! The best are made by Clark's shoes. I've worn them all my life. They are as American as Levis, and go with them pretty well.